My time at Fuze required me to adapt to rapid organizational changes. I was brought on following the acquisition of LiveMinutes in 2015. ThinkingPhones acquired Fuze in 2016 (later rebranding themselves as Fuze). As this point, the product team had to integrate all the key components of these services — a comprehensive calling system, collaborative video conferencing, and real-time caller identity — into one powerful UCaaS vendor. When I first began at Fuze, I focused on refining the integration of LiveMinutes (content sharing + collaboration) into Fuze (video conferencing) and ensuring consistency throughout the product. Our goal was to increase productivity and reduce time lost when moving in between local files, email, and cloud-based storing/sharing by consolidating these activities into one application. Here I refined the micro and macro interactions that were presented to the user. I transferred practices of product design thinking used behind social consumer-facing products to enterprise software. During this time, I delivered improved functionality for several features, including: Notifications, Calling and Scheduling, and Fuze Rooms (TV UI). Users report that Fuze provides an intuitive user experience. This allows many users to use their smartphones as their primary means of business communications. In 2016, Fuze was acquired by ThinkingPhones. Following this acquisition, the company rebranded themselves as Fuze once more, and the marketing team established a new look for the brand. Working with several other product designers, we established the UI elements that would go along with this new brand, creating a comprehensive style guide that all parts of the product would follow. The “Green Room” is the screen you see before entering a meeting. Here, users are able to comfortably check their audio/video and avoid fumbling around with settings while in the meeting — How do I look? Is my mic working? Following Fuze’s acquisition and brand redesign, I was tasked with improving the UX of the Green Room while applying the new brand to the UI. 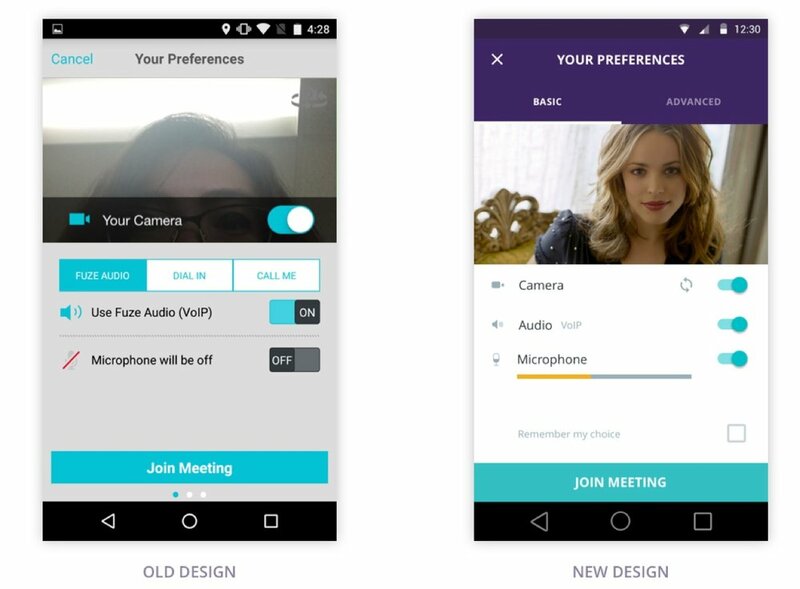 When user testing, we saw that people were often confused when presented with all audio options up front. Using Mixpanel, we discovered that over 95% of users were entering meetings with the standard VoIP settings. Fuze’s mobile UI was also outdated and didn’t conform with Android design standards. To reduce cognitive load, I decided to split the settings between “Basic” and “Advanced”. Audio and visual settings are secondary, as they are not frequently changed. 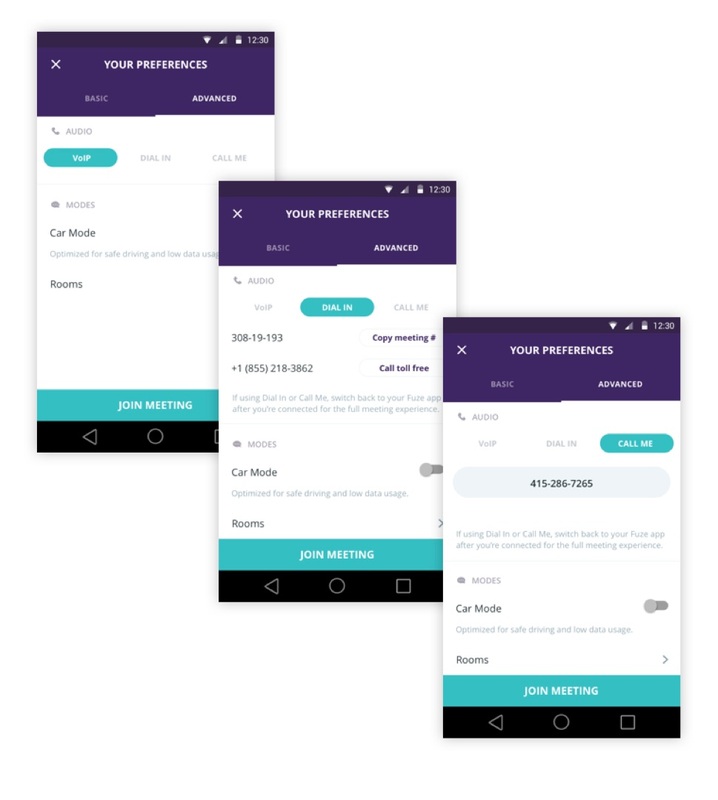 There is optional Car and Room mode available to users. Car mode is automatically detected by the phone’s accelerometer. Room mode is to join using a meeting room’s conferencing system. No matter what mode you’re in, the CTA now clearly states how you are joining the meeting. As a result of the redesign, we saw an increase in usage of our mobile app for joining meetings, and on average 10 seconds less time spent on this screen.